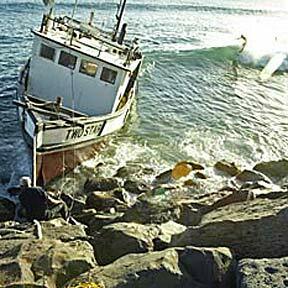 Crew members of the Two Star salvaged what they could from the vessel yesterday afternoon. The boat, which ran aground with engine problems, is starting to break apart. Some retailers began lowering prices as early as Saturday, two days ahead of this week's 44-cent drop in wholesale price caps set by the state Public Utilities Commission. Bea Youngs is after respect in the male-dominated sport of paintball. The former UH coach would like to see his Spartans finish strong like the 1977 'Bows. The selling price, which comes to about $213,000 per room, is more than twice the amount paid for the hotel just five years ago. A task force is examining proposals to provide health insurance for the 10 percent of Hawaii residents who are uninsured.